This summer, British drivers can look forward to a new, refreshed Toyota Yaris. 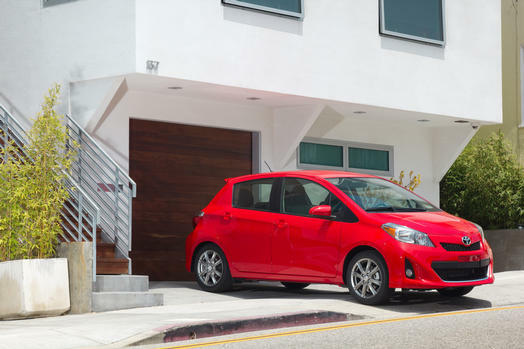 The city-friendly subcompact is getting some funky new upgrades, both inside and out, that are sure to draw drivers—both new and experienced—to the brand. And hopefully within the next few years, we in the US might be lucky enough to see some of these upgrades make it into our version of the Yaris, too. Most noticeably, the redesigned British Yaris is getting a newly styled front end that draws inspiration from the recently-revealed Toyota Aygo. In addition, the Yaris receives restyled taillights, a diffuser, and a reshaped license plate area. Due to the discrepancy between the UK license and the US license, this change isn’t necessarily on the table for us. However, the redesigned British Yaris’s front end now includes a cross-shaped grille that makes the car stand out from its competitors, and separates the upper and lower grilles with the Toyota badge as the centerpiece. Inside, the British Yaris gets more room, higher quality materials, and increased choices for colors and available equipment. Engine choices follow those offered in mainland Europe—a 1.0-liter and a 1.3-liter petrol motor. Additionally, the Yaris will come with an available 1.4-liter diesel engine, as well as a hybrid motor for increased fuel efficiency. This facelifted version of the Yaris we know and love will be offered in the UK for a starting price of ₤10,995, which translates to approximately $18,870. However, if this version of the Yaris makes it across the pond we can expect it to sell closer to the model’s current MSRP of $14,430. If we do learn about a new Yaris heading our way, you’ll hear it right here from us at The News Wheel!